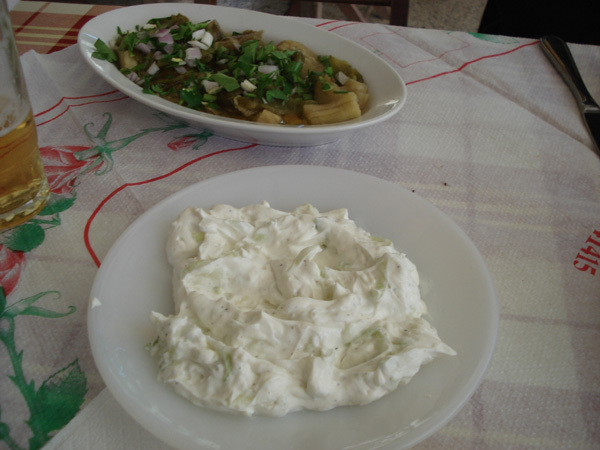 Tzatziki is a very popular Greek dish with a very easy recipe. You only need yoghurt, cucumber, garlic, salt and olive oil to prepare it. This is the best side dish! Place a sieve over a large bowl. Pour in the yoghurt and leave for half an hour to drain the liquid. Place a sieve over another bowl, add the cucumber and salt. The salt draws out the water in the cucumber. Stir a little and leave for half an hour. After half an hour, the water should have drained from both ingredients. Spoon the cucumber into a bowl. Then add the yogurt, lemon juice, garlic, dill, olive oil, salt and pepper. Mix together until it is well combined. Finally, cover with cling film and chill for one hour before serving. Spoon the tzatziki into a serving bowl and garnish with a sprig of dill or a sprinkle of chopped mint.Tzatziki is very versatile and can be served as an accompaniment to dishes such as lamb kebabs or grilled fish and vegetables, spread on squares of pita bread as a snack, or served as a dip with cruditιs (batons of raw carrot, celery, spring onion etc. ).